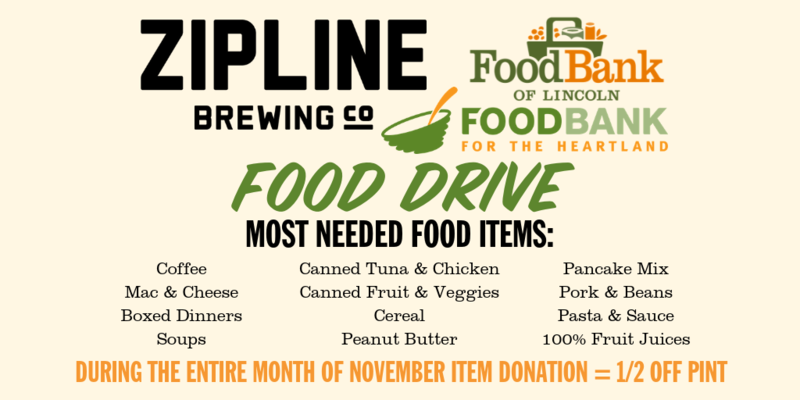 Zipline November Food Drive - Zipline Brewing Co.
Help alleviate hunger in Southeast Nebraska by donating food items to Food Bank of Lincoln and Food Bank of the Heartland. We will be collecting healthy, dry good items at all three of our retail locations; Brewery Taproom, Beer Hall, and Omaha Taproom throughout the entire month of November. Donate an item at one of our taprooms and get 50% off a Zipline pint. Please, look over the list provided by the Food Bank in order to donate appropriate items. The Food Bank encourages pop-top lids on cans whenever possible as well as low-sodium vegetables and fruits in their own juice instead of syrup. This is a way to provide healthier options for hungry neighbors.